I love this app and it has helped me and my doctor to spot specific signs of not feeling well and moments when things are going good. My only complaint is when it’s time to log my mood it doesn’t always give me enough time to get into the app and answer the questions so I only end up catching the notification once a day instead of all three times. when you log in an entry it asks you what emotions you are feeling, and they list a couple to click on. i think you should just list them all! i often cant tell what i’m feeling or i do know i just.. don’t? but i feel like that would be very helpful to make me feel like im actually being understood through the entries. This app has really helped me transition through a rough time in my life. So great for anyone who is going through a transition or thinks they are experiencing symptoms of a mental health issue and doesn’t know if they should get professional help or not. Super easy to use too! I’ve been using it for 6 weeks and it’s amazing to actually see the progress I've made over just that short time as I’ve taken steps to improve my mental health. Highly recommend!!! This app has a lot of potential. 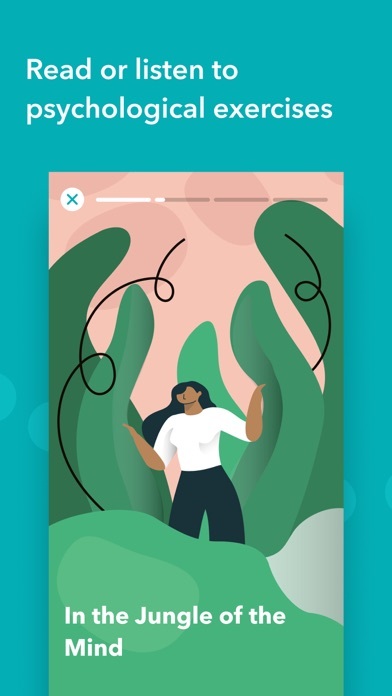 I’ve used it multiple times every day for the past couple of months, but ultimately it doesn’t provide what I need in a habit tracking app: the ability to identify trends and behaviors with mood. The ways I think it can fix this is for users to decide when all three question reminders are sent throughout the day (versus basing it off of a person’s wake time). I’m aware that my mood dips drastically in the evening, but the app never prompts me to answer questions at that time (it’s always too early). It also provides a few standard emotion buttons to click and you can add your own (the same for activities). Unfortunately, when you add your own, there’s no way to see what you’ve typed in the past (to use the same wording so it tracks it as a repeat emotion or activity). “Danced” and “went dancing” don’t add up. I’m also not excited about the two week breakdowns. I wish there were another graph that could combine moods/times/activities for the user that can identify trends. It would be awesome if it could outright say, “On 80% of your bad moods, you did this activity _____.” Or, “it looks like your evenings are difficult. This could be due to _____. Here are some suggestions to address mood fluctuations during the day.” Another idea is to integrate medication tracking so users can identify side effects that they otherwise wouldn’t pick up on. 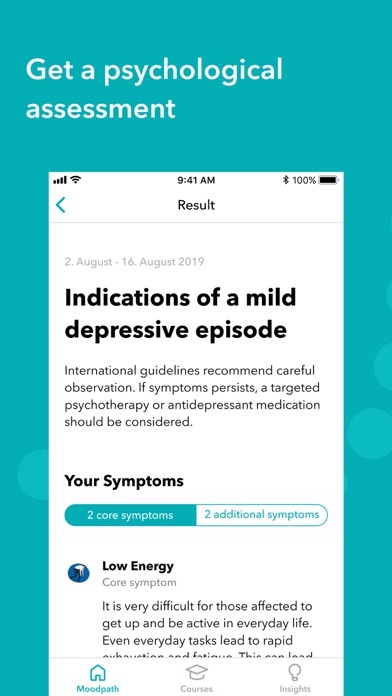 For example, this app could really help people who are starting antidepressants to actually see a shift in their mood when they otherwise might think is the way things have always been (whether good or bad). This app could be a huge communication platform for drs and patients in that way. Anyway, I’ve continued my search for an app that better fits my needs. I’ve learned a lot from this app, but I need more data I can work with. 04/14/2019 Randomized questions are fine it fails to log entries often enough that i'm not as thorough anymore,this thing is worst than a new york therapist. it's stressful, inputing info is an anxiety inducing guess. why can I see I that I have pending inputs yet can't complete from within the same window? why do I have to re input data if I another app us used before completion? like answering the phone or texting? why does it sometimes help me guess the emotion i'm looking for and others it will not? 4/8/2019 update: still frustrating and now that I've used it for a couple of months I don't see it's utility.the randommnes YOU explain is not the kind that I'M experiencing. I understand what you're saying,it's not what's happening to me.Un intuitive. No easy way to find help. Reminders and notifications meek at best, easy to miss and hard to rectify.when do you answer questions? Seemingly random. I struggle with depression and I self harm. The app helped me sort my thoughts and find ways to cope with my feelings. I just want to give a huge thank you to Moodpath for helping me to through everything. I hate the new layout. And honestly. It just causes me more anxiety. Idk if I will continue to use this app as a result. The app is pretty cool in terms of mood tracking, but over time I noticed it fails to save entries, such that times I know I entered disappear by the end of the day. At first I questioned whether it was user error, that I had spaced an entry, but when I kept close track, I discovered it is losing saved entries, up to five or six a week. Not gonna lie, I found it discouraging. Seems like the devs need to do some cleanup. I really like this app. I basically use it as a journal. It’s a great way for me to keep track or my mood and what I was doing at the moment. However, I have encountered a few bugs that I would appreciate if they got fixed. Firstly, the notifications are a bit glitchy. Sometimes I get a notification and it immediately disappears, leaving me with little time to react to it. Since I don’t have my phone on 24/7, I sometimes get the notifications and not notice them. I’m not sure if it’s because I have it set so they don’t go away until I swipe them off. I’m very forgetful, so I’d appreciate the notifications working. And secondly, another bug I encountered is when writing an entry (in the thoughts), and leaving the app by tapping on another notification makes it so either: 1. It makes it do all the questions again or 2. Doesn’t let me write on the entry anymore, forcing me to close the app and redo everything again. This is a bit bothersome if I already wrote a lot of things in the entry. I would love for those bugs could be fixed, as it’ll make a better experience when using the app. with mood swings, it’s pretty hard to get an accurate read from checking in just once a day. we do so many different things in a day, as you might have realized from using other journals, like daylio, and an analysis of what’s connected to your mood swings becomes more a measure of how you feel in general; you might find that you are sedentary every day and you feel bad every day, for example, but that’s not the most helpful input. by checking in three times a day with a few interesting questions about your symptoms and a more regular mood log, you can get a much clearer picture of how individual experiences become a pattern. i’m excited to share this mood log with my therapist and psychiatrist, and i think it’ll be really useful. I downloaded this app to get my mood boost. That’s not Ben possible anymore is it. People are so desperate for money that there is really a plus version. I’m really about to say somethings I shouldn’t say. This D.H. not helping me because in order to build my self confidence I have to pay. Who is the creator of this app. This app has helped me a lot in tracking and managing my mental state. Obviously it’s not a substitution for a diagnoses or an actual therapist but it does help you personally manage your own symptoms which is a huge part of the battle of having and living with mental illness. 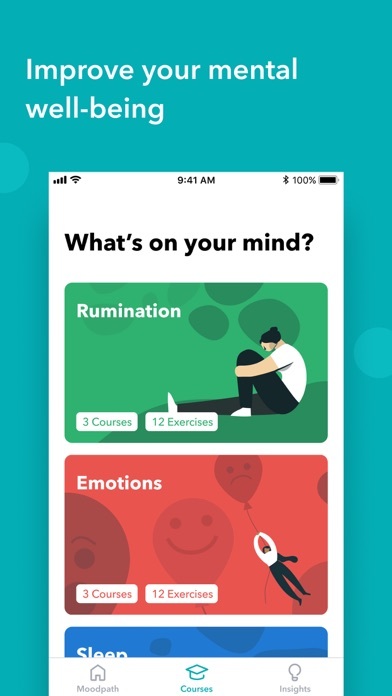 I’m happy to see that the app is incorporating more on symptoms of anxiety, mania and other disorders other than depression. A few months ago it focused only on depression really and I left a review asking for a more broad focus and I was heard! Thank you! When you miss a set of questions, it leaves a blank spot on the calendar that you can’t go back and make up. For those of us who are kind of OCD, that feels awful every time we open the app. It’s not like I can’t remember how I felt two hours ago, but if I have a busy morning, I will never be able to live down that angry gap. I think the app is helpful otherwise, but the last thing I need is the constant reminder of something I failed to do. I love Moodpath. It has helped me realize that I have depression and anxiety and made me work to get help and relieve myself of the suffering I deal with. One suggestion is that more things should be offered without paying. It feels like each question is tailored to me, which is crazy. I hate to rate this anything less than 5 stars but there’s one big reason why this app doesn’t work as well as it could for me. I realize that adding features for bipolar 1 or bipolar 2 would require quite a lot of expansion but I think it would be wonderful and immensely helpful if one day this app would grow that far. I have been trying really hard to track my mood over the past year since having my first diagnosable hypomanic episode and so far this app’s layout and functions are my absolute favorite. But when it comes to tracking hypomania or mania there is basically nothing. I know that for myself and a lot of other people with either bipolar 1 or 2, mania, hypomania and mixed episodes can be a lot harder to pin down and be aware of. I have quite a few more suggestions if that’s something any developers are open to, but I highly recommend looking into features that could apply to bipolar disorder in addition to unipolar depression. I like the app so far. I wish the notifications stayed on my screen so I could remember to do my mood. Also I wish there were more free features. Yes, it was very helpful. I really felt relaxed when I did the ONE FREE EXERCISE . Yes, you have to pay to do all the other exercises. Bs. I thought this app would be a lot more helpful, but turns out you need to pay for it, practically. If anything, finding out this whole thing is a scam made me super angry. Please give us broke people some more free stuff. We have more things to worry about and more important things to be spending money on, not a silly moodpath plus. I’m disappointed to say the least. Won’t let me answer questions or put in mood since update. I really love this app the only thing I would like that it doesn’t give an option for is notifications that it’s time to update your mood status. If I don’t remember to put in my moods it will skip them and I can return to put them in. It would be much more helpful to have a notification sent when it’s time to do it otherwise I forget and it’s too late. I love this app but honestly I think on some questions like “do you think you’ll be doing well in the future?” I think there should be a maybe option because a maybe is a lot farther then a no but I still have to much doubt to say yes, if that makes sense. I would love to see a maybe option for people like me. This is a great app and very helpful. Only four stars though because my journal calendar overview does not update accurately. When I look at my last 14 days, it will correctly show what mood I input for each of the three sections of each day. However, when I look at the full calendar, the moods from past days are shifted or sometimes just completely wrong. I am considering upgrading to the paid version, but not until this bug stops happening, as I only want to pay if my data is accurate. I haven’t completed the first two weeks of mood tracking yet but already feel very discouraged. The insights seem very helpful and almost give me hope... but it seems that all the content is only accessible through the Plus subscription. I’m having a very difficult time finding any free help to get me out of this pit. Money makes the world go ‘round. Hopelessness doesn’t. Helped me track my mood in a way that was both consistent and convenient, while being depressed it’s hard to keep a routine but this kept me mindful of how I was feeling and was of minimal commitment However, I cannot find the graph of my moods anymore after the first 14 days which was super helpful ?!?! This is a really great app and an amazing Idea, the only problem is that the timing of the questions is not customizable. I wake up at 8, so I get questions around 8, 12, and 5.. but that means that HALF MY DAY goes without questions (6pm-1am). This is bad for me because on the days that I have very low (or very high) moods it usually happens late at night. Also I have had multiple of my inputs show as “missed” hours or days after I answer the questions and add a mood which is frustrating. Lastly I wish the app gave me more consistent notifications, sometimes they are early by an hour or late by a couple of hours and sometimes I don't get notifications at all .. personally I find this very stressful because I know I cannot rely on a notification to remind me to log my mood. Overall this is a great app. I highly recommend it for everyone even if you do not have any serious emotional turmoil lol. The meditation and resources are an added bonus however I haven’t used then. Helps me keep track of my PTSD symptoms. I was using an AI chat type tracker and wanted something that gave me the options to track my mood immediately without feeling like I was talking to a repetitive therapist lol. The only thing I dislike is how few options it gives you for moods and such. You can type in other moods yourself but I like to view a list and find what resonates with me instead of coming up with them myself. (Kinda hard to do in more frazzled moments.) But that’s a note to the dev team, don’t let it stop you from trying this app. I was diagnosed with Bipolar Disorder about 2 years ago and decided to use Moodpath to help track my mood swings. At times the app sent me a notification that questions were ready for me to answer, but when I would open the app, the questions wouldn’t appear for me to track my mood which led me to miss check in points. I used Moodpath for 2 weeks and by the end of that period, it told me that I had “no indication for symptoms of depression,” but listed below a plethora of my depressive symptoms like feelings of hopelessness, fatigue, insomnia, worthlessness, etc. 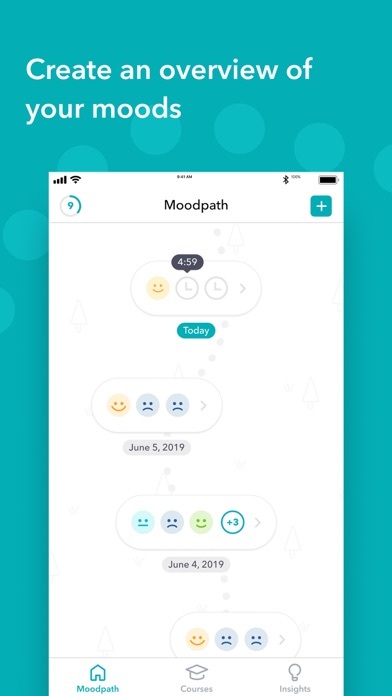 I was using this app to track my moods throughout a depressive episode that has spanned over the last month for me in the hope I would get some insight, but Moodpath seemed to deliver only contradictions and an erroneous algorithm. I’ve decided to delete the app altogether and stick with what I know helps me stay on top of my mental illness: therapy and medication management. App looks to be helpful. Have yet to get to 14 days yet with it. 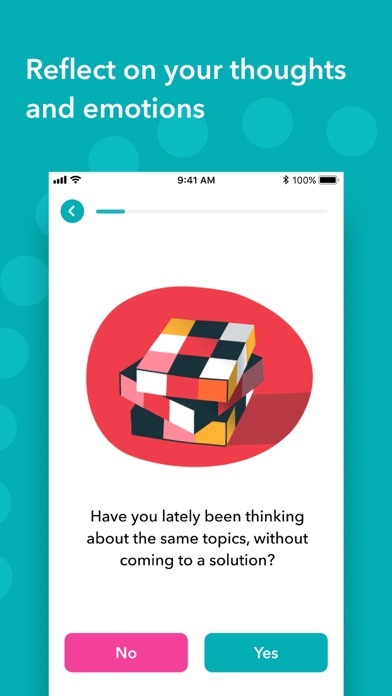 Daily check up questions are nice and using the thoughts box is like a nice diary feature that I could use half the time. The take a pause and insight is very helpful for when you need a quick read on how to handle something bothering you and attempt to move past the negative feeling. Not pleased with a lack of a settings section (at least one I found right away, which should be easy to find), and that if you go back to change the mood for time of day on an entry, it completely clears it on the other page. I spent 15-20 writing out things in the thoughts section and placing moods and experiences, only to be wiped when I moved my mood up on the other page. I really like the app, but my questions won’t pop up for me to answer. It’s been doing thins for about 1 week now. I wish that there wasn’t a plus option and that all the features were available to everyone I feel that everyone would benefit from this and should have access to it because it’s helpful. I started using this app out of curiosity after a loooooong period of not feeling like myself at all. sometimes I’m not sure it’s really that accurate in its assessments, and I get a little irritated at answering the same questions over and over again, but this app became such an honest relief for me when I was sick. It was like I could be honest and vent and express what was happening with me in the journals and I would address my problems with the questions. I think this app is veeeerrrry attentive and definitely does its best for you. I loved this app at first. I could explore and do what helped me with sleep and feeling sad. Now, all of a sudden, I have to pay for everything. I don’t think I should be paying to get help. Just an thought. The whole point of this app is to give you an assessment after 14 days. I completed the first 14 days and—nothing. It just started over without ever giving me my assessment that I was looking forward to seeing. What’s the point? I feel like I wasted all the time I spent tracking and answering questions. I love Moodpath. It has helped me to understand that I suffer from depression and anxiety. Without this app, I wouldn’t be tracking my mood throughout the day and voicing my thoughts. However, I am very disappointed that the original audios from the pause section are no longer there. I understand that the app needs to make money hence the monthly “membership”, but I would really appreciate if the stories, mindshuffle, and other audios were added back. In my opinion, that was the best part of the app.